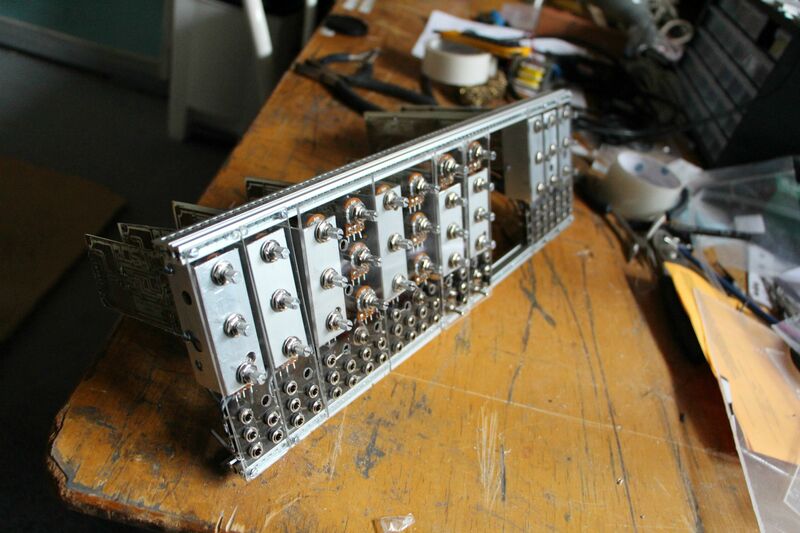 A few months ago I decided to start building an all analog, modular synthesizer, which is still in it’s build process. Some time after that, my school asked us to take on a project of our choice. I decided to create code for a MIDI to CV interface to complement the modular. This video explain it’s overall functions and modes. Basically, this « pseudolibrary », aka a .h file which is just located in the sketch’s folder uses the MIDI.h library to read for incoming signals. When an incoming signal is received, it gets to a function which manages it. If there is no output which carries that that type of output, it’s ignored. If one of the outputs does carry this type of signal, the signal goes on to a function which determines to which output the signal has to be sent by looking up it’s type and parameters if it has any (for example, a CC’s id). When a match is found, the value gets sent to a function which maps the value so that the output voltage makes sense (for notes, it’s mapped in either Hz/V or V/oct). For notes and data that are linked to individual voices (gate, note, velocity and poly aftertouch), there are a few extra steps relative to polyphony gestion. This is the circuit I’m currently using to connect the MIDI input to the Arduino. If you plan on building an interface, I’m strongly recommending to use a DAC with a minimal resolution 12 bit over 5 volts if you want to get decent accuracy. Take into account that, using volts/oct, the steps are 0.083v each, so just a small error can cause a lot of detuning. I also recommend using a MCP4728, which is a 4 output 12 bit DAC you can get for 3$. Someone has also written a library for it, which you can get here. This library was written on an older version of the Arduino IDE, and some basic function syntax has changed since, which causes the library to fail to compile. Fixing it is quite easy and is described in this thread. To make this work properly, we have to do a few things. First off, at the top of your file, you must include the MIDI.h library and initialize it (get it here if you don’t already have it). Before we include MIDItoCV.h, we must define a few values it needs. Ok! now we can include MIDItoCV.h Here’s the download link for my code , released under Creative Commons liscence BY. Remember, MIDItoCV.h is not a library! you must put it in your sketch’s folder! Finally, you need to put MIDI.read() in your loop so that we read incoming MIDI data. Now, you may use a few functions in your setup to assign modes, parameters and ways to output data to each of your outputs. Note that you are not limited to using these functions in the setup. outputnumber is the number of the output, ranging from 1 to AMOUNTOUTPUTS you defined earlier. mode can be one of the 8 modes; NONE, NOTE, VELOCITY, GATE, POLYAT, CHANNELAT, BEND, or CC. parameter is additional parameter that is only used for polyphonic modes and CC. For polyphonic modes, (NOTE, VELOCITY, GATE and POLYAT), the parameter is the number of the voice. For CC, it simply is the continuous controller id. If you were a bit confused about the last parameter, it’s essentially the name of a function which takes a value and outputs it where you want. Here’s an example. Since it’s quite likely that your outputs use the same way of outputting data (the same range of values over the same voltage), it would be annoying to have to define their output range/voltage parameters individually, which is why the function setoutputrangeall(minvalue, maxvalue, minvoltage, maxvoltage) eexists. The parameters are the same as the last functions apart from the absence of the outputnumber parameter, since you are selecting all outputs. A in-depth guide covering advanced functions should be released soon.